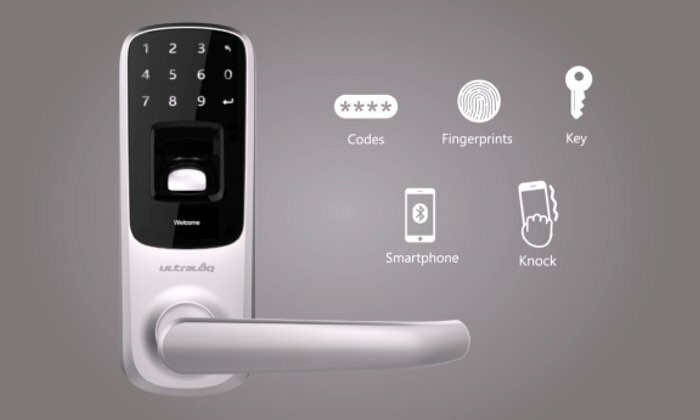 A new Bluetooth enabled fingerprint and touchscreen smart lock has been created called the Ultraloq UL3 BT, that has been designed to be ‘RealKeyless’ for maximum flexibility and convenience say its developers. The new smart lock allows you to use your smartphone and companion app, key, code or even your fingerprint to unlock any door that it is fitted to. Watch the promotional video below to learn more about this unique smart lock and its features. The Ultraloq UL3 BT smart lock is currently over on the Indiegogo crowdfunding website and has already raised over $56,000 with still over 30 days left remaining on its campaign thanks to over 270 backers. Its developers explain more about the inspiration and construction of the new smart lock. Your smartphone is now your key. Just unlock your door using the Ultraloq App on your phone. Ultraloq UL3 BT uses Bluetooth Low Energy which means that Ultraloq will keep working even in the event of power or internet outages. “Anti-peep password” ensures that strangers can’t steal your password by looking at worn-out keypad digits or watching you nearby when you enter the password. This function allows the user to type in any number of random digits, and can still gain access as long as the 1 correct password is embedded in the longer set of numbers. 3 mechanical keys for backup. A keyhole is positioned specially on the bottom to give extra security in case of keyhole hackers. You don’t have to open app. Just knock on your phone twice, even when it’s in your pocket and you’re in. 3 AA batteries. Up to 8,000 times access. Low battery alerts on LCD and App. Innovation in clutch design makes UL3 more reliable but 50% less power consumption than traditional clutches. For more information on the new Ultraloq UL3 BT smart lock jump over to the Indiegogo website for details via the link below.